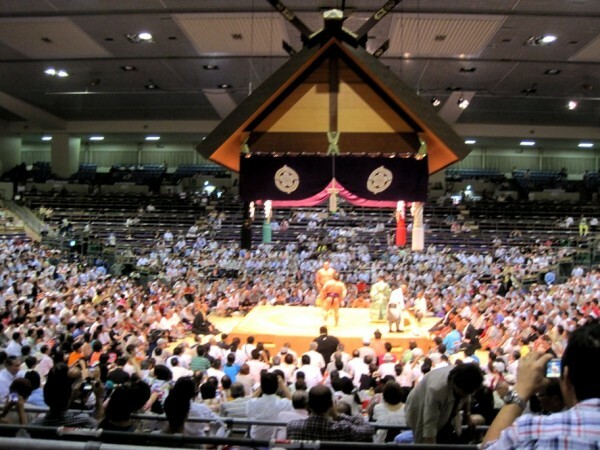 Sumo wrestling is something that lots of us have wondered about. Well, my nephew and I had a chance to go to a sumo tournament while we were in Japan. In fact, the first part of our trip was built around the idea that we go to a tournament — there are six annually in four different cities. So Nagoya became my point of entry to the country and the tourney’s start just a few days later meant we could wander a bit & come back for wrestling. That’s how we ended up going to the tanabata festival and sightseeing in Tokyo’s electric city. We were both really excited to go to the tournament and decided we would go for the full day! 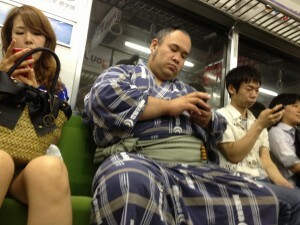 My excitement level was peaking already as I sat across from a sumo wrestler on the subway! 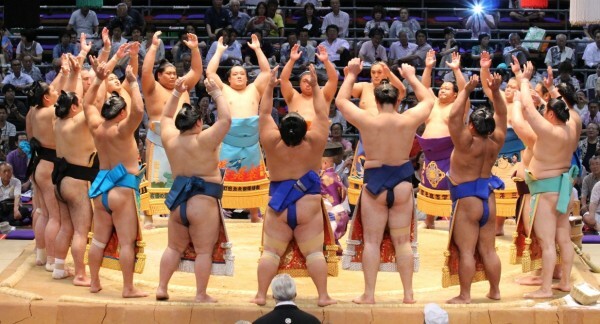 The symbolism and rituals preformed at sumo tournaments is something that is not common with American sports. The ceremonies are something that truly stands out as I think about the day in the arena. Everything is built around the clay ring that is up on a platform. And that ring in honored in a variety of ways including a purification of the ring with salt and from where I sat, it appeared that everyone involved wanted to participate in that spirit of honor not only in the ceremonial sections of the program, but throughout the matches too. That was impressive! Above the ring was a wooden structure that was similar in style or design to some of the temples and castles we saw as we visited. It was beautiful. Before the higher achieving wrestlers have matches, there is a parade where everyone in that group enters and performs some ceremonial acts. It includes all of them offering their respects. 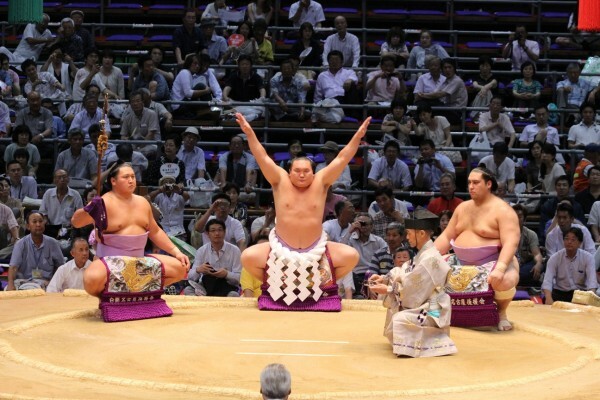 There are also other ceremonies performed by the most accomplished sumo wrestlers, also called the yokozuna. And prior to each match there is a ceremonial start, with various stretches and movements, as well as spraying salt in the ring.